Brazil will allow visa-free entry for citizens of the US, Canada, Australia and Japan beginning on June 17. Until then, the current e-visa will be required. Citizens of those countries wishing to visit Brazil will no longer need to apply or pay for a visa. They will be able to stay in Brazil for 90 days from the date of first entry in the country, extendable for an equal period, provided that it does not exceed 180 days, every 12 months, counted from the date of the first entry into the country. 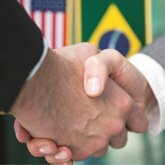 The US government is not planning to reciprocate with a visa exemption for Brazilians, according to officials with knowledge of the matter. The exemption, published in the government’s official gazette, coincides with President Jair Bolsonaro’s visit to Washington this week.